Google Maps is driving donuts around other free iPhone apps, skyrocketing to become the No. 1 most downloaded installation. It pushed aside Fun Run, YouTube and Interlocked to take the crown. Maps' meteoric rise isn't likely to slow any time soon as users (including the iOS-owning among us here in the TechRadar office) can't contain their excitement over the app's new found availability. Consumer reviews - of which there are over 8,000 - are generally effusive. "Better than apple maps," one reviewer wrote. "I almost died in Australia, thank god this is out." Customer ratings (13,212 and growing) have generated a 4.5-star overall score for the app so far. 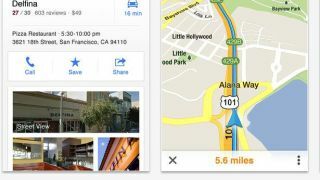 While some are commenting that Apple's Maps wasn't so bad, the general consensus is that Google's take is much better and much preferred. TechRadar's early take comparing the two found that Google rules the cartographic roost. Turn-by-turn navigation is a top feature of both apps, but when it comes to accuracy, Google wins out. Apple Maps isn't horrible - in tracking down a specific address, iOS 6's version stacks up. But when it comes to looking up business names, well, you're better off not using it at all. Though most are heralding the arrival of Google Maps to devices like the iPhone 5, people in Australia aren't having luck with either it or Apple Maps. A report earlier this week had police in Victoria urging people to steer clear of iOS' navigation tool following multiple instances of motorists becoming stranded in a national park. The park, it turns out, wasn't the intended destination - a town of 30,000 was. Now, police in another part of Aussieland are saying that issues with Google Maps can lead users down a potentially dangerous one-way road, one that's especially perilous for trucks, buses and tourists as it's not intended for heavy traffic. It's unclear if the issue exists with an older version of Google Maps or the recent release for iOS, but the warning serves as a reminder that residents on every continent might want to bust out a paper map once in awhile.